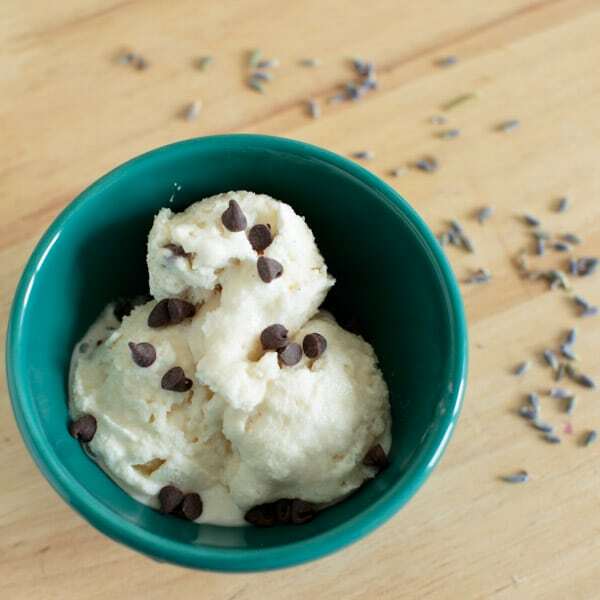 Lavender Honey Ice Cream with Chocolate Chips – The perfect unique ice cream flavor for that will have everyone asking for more. No eggs required. Considering I just posted a cookie recipe I wasn’t planning on posting another dessert today. But I just found out today (July 17) is National Ice Cream Day, so I figured now was as good a time as any! I have been obsessed with the idea of cooking with lavender for a couple years now. Notice I said “the idea of” because I had so many ideas for it but never actually executed on any of them until now. When I heard of lavender ice cream it seemed like the perfect recipe to try out. I’ve seen lavender ice cream made several ways – some with blueberries or blackberries, with or without chocolate, or sugar instead of honey. The first time I made this, the honey flavor was a bit strong. Still delicious, but my taste testers (i.e. friends) said it almost overpowered the lavender flavor. So I lessened the amount of honey in the recipe (1 cup to 1/2 cup), but this is just something to keep in mind if you want to increase or decrease the honey flavor. Alternatively, you could do half honey and half sugar. The kind of lavender you use will obviously affect the outcome and how fragrant it is. Just be sure it’s culinary lavender! The kind I have is quite strong. I’ve also seen lavender oil used instead of steeping dried lavender, but I haven’t tried that. Just by looking at this ice cream you wouldn’t know it’s lavender, so if you want to make it purple you’ll also need food dye. 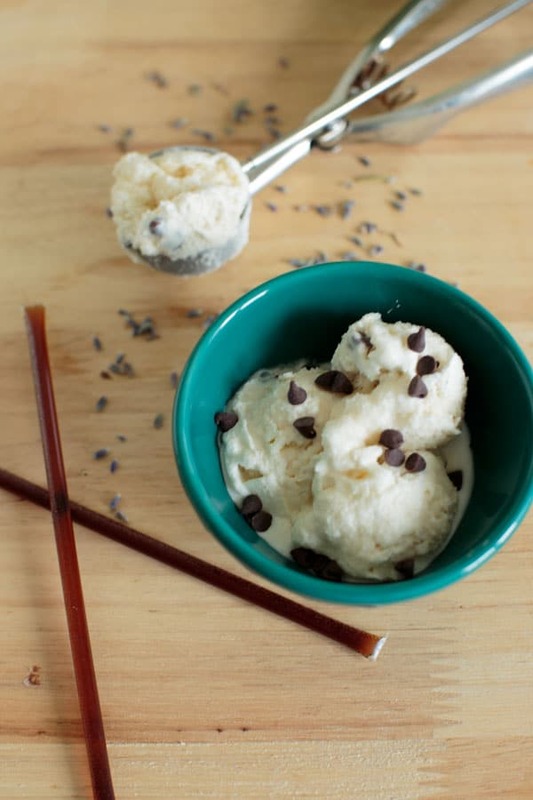 Will you try lavender honey ice cream? What’s the most unique flavor you’ve tried? 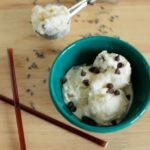 Lavender Honey Ice Cream with Chocolate Chips (no eggs) - The perfect unique ice cream flavor for that will have everyone asking for more. In a medium sauce pan, add the cream, half and half, honey and salt. Cook over medium heat until it comes to a low simmer, stirring continuously. Cut the vanilla bean lengthwise and scrape out the paste from the bean to add to the pot (or add vanilla extract now). Stir. Remove from heat, and add the dried lavender. Let cool slightly for 10 minutes then refrigerate for 2-4 hours. 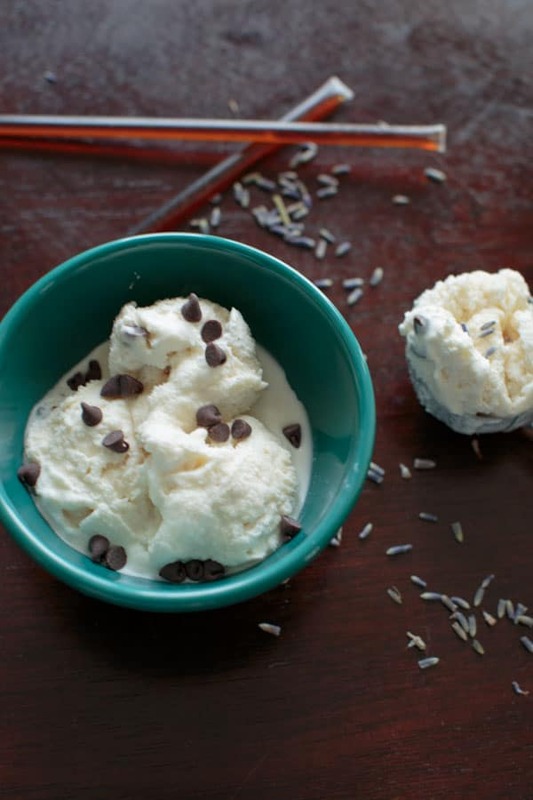 Once chilled, strain the lavender buds from ice cream and add chocolate chips. Add mixture to ice cream maker and churn according to maker instructions, about 20 minutes or until thickened. Serve immediately or freeze for later.